240 Volt electronic discharge broken tap removers. Eumach FBE Universal CNC Bed Mills with travels from 1500mm to 4000mm in X, 950mm or 1500mm vertical and 1000mm cross. 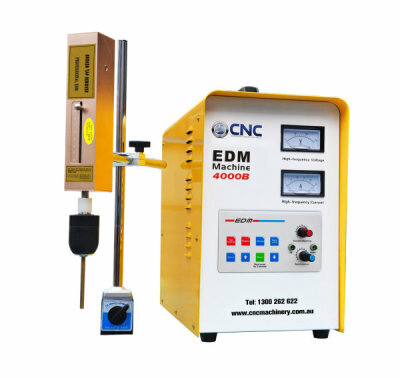 Options include 2.5, 1 or 0.001 degree automatic universal heads, various tool change systems, 4th axis rotary and indexing tables, high pressure through spindle coolant and more. CNC Vertical Borers / CNC Vertical Lathes from 600 mm up to 3,400 mm turning diameter. 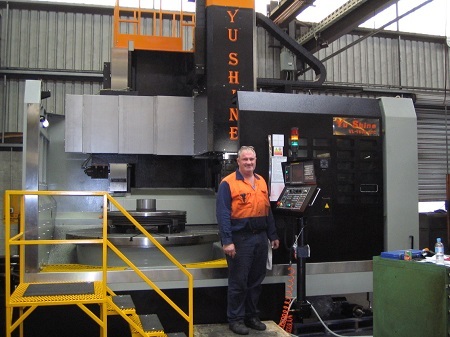 Pictured is one of two special 1600ATC's with 1950mm turning diameter at John Heine & Son (est.1886) in Sydney. Typically the materials machined are high chrome cast irons with hardness values of 650 to 700 Brinell.